GunTec is a modern, special gun oil for the durable care of all guns such as sports, tournament and hunting guns, large and small calibre and air pressure. It is also suited to powder guns and for the conservation of antique and/or shiny metal guns. 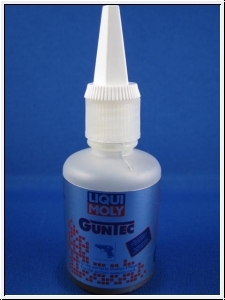 GunTec gently dissolves and removes powder and dirt residues. GunTec protects against corrosion and oxidation, eliminates damp, is able to creep into the smallest of cavities, and reduces friction and abrasion through its special EP additives. GunTec is neutral against plastics, paints, metal, wood and black finishes. It is odour neutral and economical in use.